The sight Falcon NCS-03 Pro is a night vision rifle scope of the 1st generation with the built-in infrared illumination. New features, improved from Falcon NCS-03. 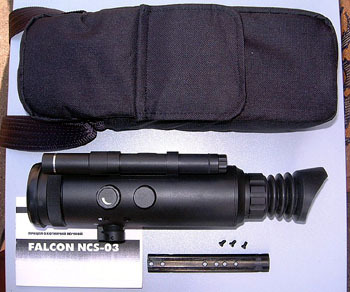 Falcon's intended for attitude on terrain and supports of aim shooting from the hunting weapon in conditions of low intensity of illumination at temperature of air from a -20 up to +40 oC (the temperature range depends from used batterys and can be expanded by applying batterys of high quality). -The silent transducer of voltage. The sight has protection against light overloads and electrostatic protection of an image-converter tube boosting purity a field of vision. In the sights the original system of gears of adjustment is applied, due to which one the aimiing reticle always is in center of vision field. The mounting bracket is hardly body-mounted. The system maintains impact loads up to 500g (SVD/TIGER/AK) and main - it's tested by time. 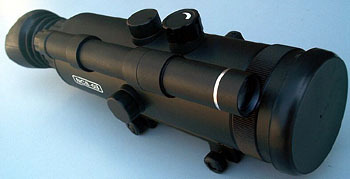 The sights have high-performance coated optics specially intended for applying in night vision devices. The projection aiming reticle of red colour is user-friendly and is well appreciable in any conditions of observation. The devices are extreme simple to service, will use widely widespread and cheap batterys and will be efficient in any climatic conditions. - NEW Falcon sight 1 pcs. - Operation manual in English 1 pcs. - Weaver rail 1 pcs. Rifles with standard Weaver mount.